The picture shown is of one of the earliest Jain Ambika depicted anywhere in India. This sculpture is hailed from Aihole’s Meguti Jain temple. Prior to this image, Jain yakshi Ambika is depicted at Akota in Gujarat state and Badami jain cave no. 4 in Bagalkot district of Karnataka State. The yakshi image of Ambika from Meguti Jain temple is believed to be carved during Early Chalukya period of. 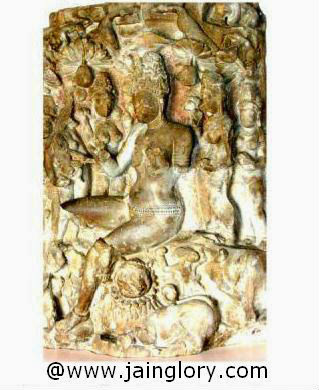 Date of sculpture goddess Ambika could be fixed around 634 AD during reign of great Chalukya monarch Pulakesi II. According to Scholar and historian Maruti Nandan Prasad Tiwari this image is beautifully carved and refined as compared to Badami’s Ambika sculpture. Generally Ambika was depicted with two hands prior to 8th Century AD. Her association with savior Neminatha is not restricted till 8 century AD. She was not associated with Neminath but also with Rishabhnath, Parshwanath and other saviors in Akota, Dhank and many other places.